And I feel it couldn’t be more true. This represents something a LOT of internet marketers struggle with – and I myself even hold up my hands up to this one. Over the past 3 days I’ve done nothing to my business… Zilch. That’s because over the past 3 days I’ve been re-writing my “About Me” page. My “About Me” page is only 747 words long (well at the time of writing this it is anyway). So you’re probably wondering why on earth it’s took me a whole 3 days to re-write it. The answer to that is because I’ve been messing around trying to make it “perfect”. I’ve been typing paragraphs, deleting paragraphs, re-writing paragraphs, adding images, deleting images, re-sizing images. You name it – it’s happened. And what’s a “perfect” About Me page going to do for my business? So effectively all that time has been wasted – and all that time is time I could have been using to do something productive with my business. All that time is time I’ll never get back. The worst part is that it’s not the first time I’ve wasted time like this either. In fact I actually do it quite often – I feel like I have an “OCD” for perfecting my website. And even when I think I’ve got it perfect I end up seeing somebody else’s website which looks better and makes me start the whole process again! I’ve lost count of how many different themes I’ve installed on this website – I’m not even 100% happy with the current one, I just stuck with it because the search for perfection seemed never-ending. I was so relieved when I seen another blogger writing about the exact same thing – how much time he was wasting trying to make his website “perfect”. He was changing font sizes, moving columns around, and wasting tons of valuable time just like I was. But you know what I’ve come to learn? As long as you’re giving somebody the information they want, they’re happy. It of course helps to make things presentable, but perfect – it doesn’t exist. Seeking it will kill your business. While I was “playing around” with the broadcast email I was planning on sending out, you know what the other marketers were doing? They were sending broadcast emails. So while I was playing around with mine, they were making money with theirs. Then by the time I’d come round to sending mine, you know what they’d done? They’d published a blog post. I was getting left behind because I was wasting time, and as an entrepreneur there is nothing more valuable than time. Time management is the #1 key to becoming a successful entrepreneur. 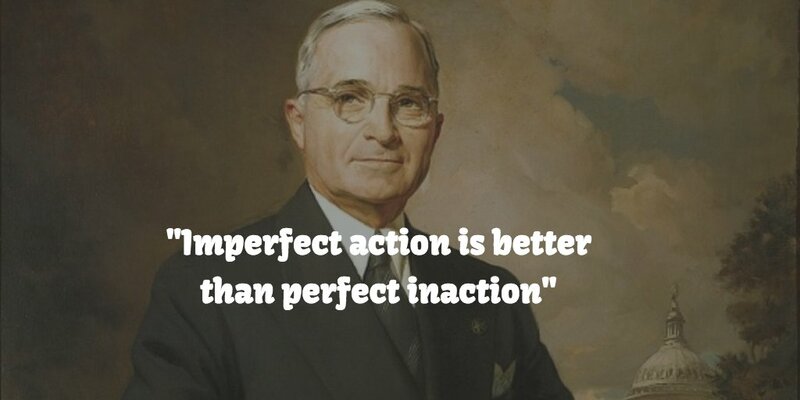 The moral behind the quote is that while you’re messing around chasing perfection, you’re not taking action. A business is built by taking consistant, regular action. It doesn’t matter how big or small it be, as long as you are doing something towards your business, it is growing. So whether it’s your website, your sales letter, your email follow up – no matter how perfect you make it, it’s not going to be of any help your business if it means your not taking action. The bottom line is that you’ve got to get the idea of making things perfect out of your head, and focus solely on taking action. You just need to make sure that every day you are doing SOMETHING that will help grow your business.